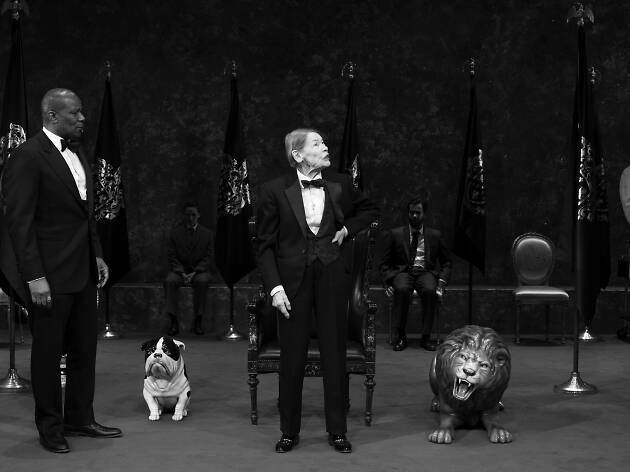 Glenda Jackson is in her own world as the maddening monarch of Shakespeare's tragedy. Gold’s production is full of interesting directorial choices that do not quite cohere into a shared universe for King Lear’s characters to inhabit. The subtle Ruth Wilson plays Cordelia with soulful, depressive interiority—in a wise stroke of casting, she doubles as the Fool—while the hyperintense Aisling O’Sullivan, as Regan, looks at every moment like lasers are about to shoot from her eyes. Jayne Houdyshell, John Douglas Thompson and Dion Johnstone offer conventional turns as the play’s Lear loyalists; Sean Carvajal flails through the thankless role of Edgar. The Duke of Cornwall is played, in a kilt, by deaf actor Russell Harvard, with Michael Arden signing translation. After intermission, the string quartet moves to the front and briefly plays directly to the audience, as though we were guests at a fancy cocktail party. 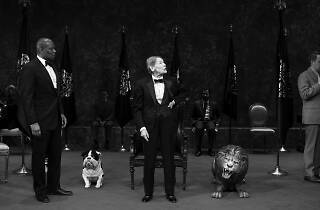 For all its sometimes outré choices, this King Lear is, in its way, a cautious and tasteful prestige-theater event. Shakespeare’s play is huge, full of wild stretches of language and feeling. Yet Gold seems to strive for something smaller. Lear’s rowdy train of knights is a few gents in tuxedos opening bottles of champagne; even the grotesque blinding scene seems oddly heavy-lidded. And Lear’s death, in this account, is nearly as much of a shrug as Oswald’s: The end comes suddenly, tactfully, almost as an afterthought. This production doesn’t want to be indulgent or overwrought; perhaps it doesn’t want to risk dishonesty. But after three and a half hours of diffuse dramatics, I felt nothing. Cort Theatre (Broadway). By William Shakespeare. Directed by Sam Gold. With Glenda Jackson, Ruth Wilson. Running time: 3hrs 30mins. One intermission.